What is yellow and weighs as much as 132 elephants? The damper inside the Taipei 101 building, that's what. It is a 660-metric-ton tuned mass damper with a diameter of 5.5 meters, which helps to stabilize the tower against movements caused by high winds. The damper is five storeys high, suspended from Level 92 to Level 87. So: it's a great big, yellow ball that keeps the building from swaying, which is a good thing because it's built in a typhoon and earthquake prone area. Before Taipei 101, no building had been built to withstand both of those natural forces. The design, therefore, needed to be stiff enough to combat winds and flexible enough to endure earthquakes--these two are conflicting engineering feats. 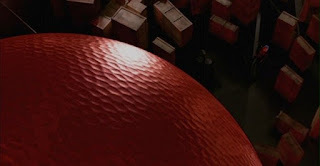 I look at the 101 damper and think of this giant red ball--the one from the Alias TV series. It hung in the air over a city in Russia and everyone turned into zombies. There are these odd little characters called Damper Babies, and I am thinking that they are a part of the conspiracy. Don't believe me? Why do they have a secret base? The damper, yes. A whole lot to do with physics and little bit of conspiracy theory. The damper babies are kinda creepy.